This is the first of a series of blogs about using technology to assist and improve your coaching. I look forward to any comments and contact from coaches on using technology in sport. In this article, I am going to discuss the use of your phone and smartphone apps and how they may be useful in coaching at all levels of sport. I questioned whether my coaching had directly improved any of the players personal skills. Some players had improved as a result of age and experience, many achieved representative teams and progressed to higher levels but the harsh reality was that I didn’t feel I had directly coached specific players. I had implemented systems and managed the players within those systems, I ensured that players understood their role in the team and encouraged their contribution but had I changed, or more importantly improved, the technique of a player directly through my coaching? The decision was made to introduce an individual skills session at the start of Tuesday training each week utilising video to make this more efficient. Players performed skills drills either personal work ons or drills negotiated with the coaches and video was taken – using an assortment of video devices owned both by players and coaches and then the use of the video analysis apps, Coaches Eye and Ubersense. 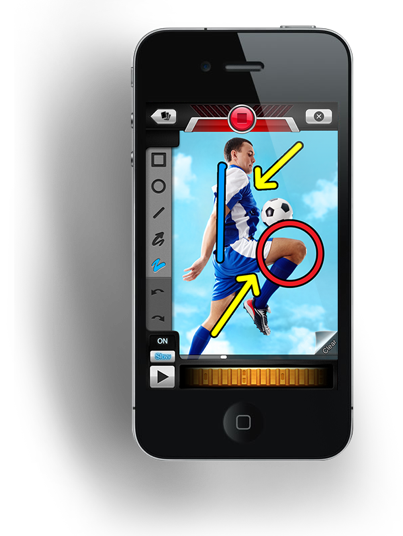 Video Analysis Apps- Coaches Eye and Ubersense. Which of these two apps you use comes down to personal preference and what type of Smartphone you own- I believe the features are practically interchangeable thus your decision becomes more about cost and accessibility. Coaches Eye is available for both Android and IOS devices where Ubersense is only available for IOS – however, Ubersense is free and there is a cost associated with Coaches Eye. Ubersense is only available for IOS devices and comes with all of the various upgrades as part of the download – at no cost, as such I have found athletes are more likely to engage with the app. Someone without a smartphone is not excluded athletes and fellow coaches without the app can still receive and view the videos that you have made. coaches or yourselves can video the player taking part in a skill. This skill can then be reviewed using a slow motion fly wheel either side by side with the athlete or after training and then shared with the athlete via email. You are also able to compare this video with other athletes in your team or even professional athletes. Videos can be downloaded from the internet and added to the app as well as taken in real time. 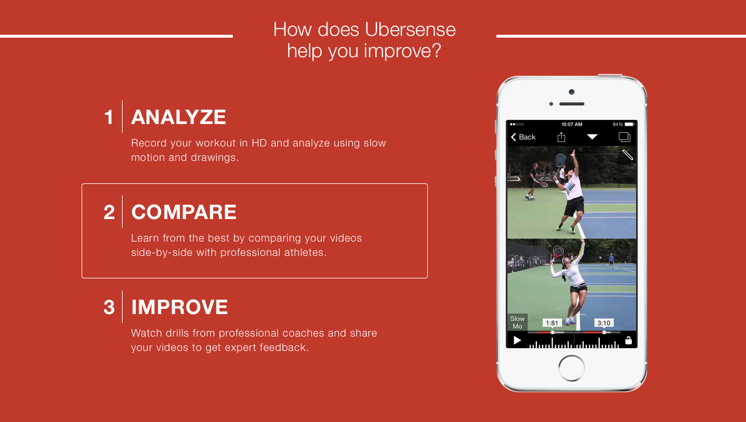 Both Coaches Eye and Ubersense are now trying to extend their community feature – people can opt to share their videos for comment around the world and download videos from the community, often of top athletes performing the skill you are coaching. This gives us the opportunity as coaches to ensure that we are improving our players, with the ability to review video of their skills and comment on their performance. We then share these comments with the athletes either face to face or via the app/email/facebook/dropbox. 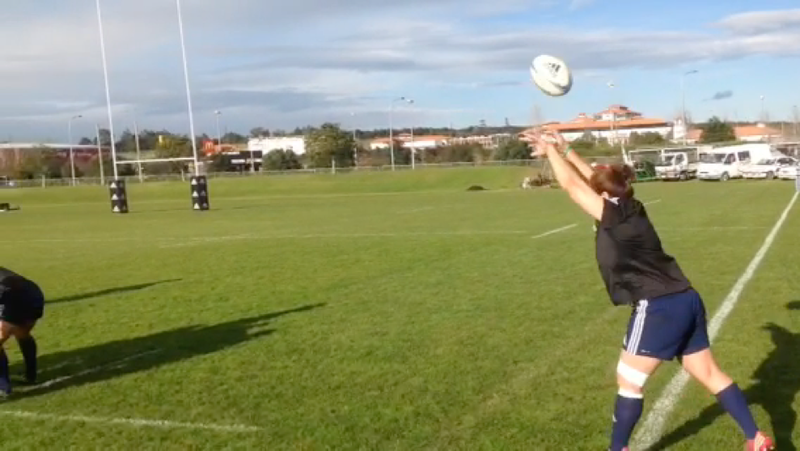 Coaches Eye showing use of drawing tools, This image, taken from a video I made on the run, shows the utilisation of smartphone technology whilst I was coaching at a Black Ferns training session. We were using the tech to ensure that the athlete understood visually the coaching guidance I was providing. I am very keen that the use of technology should not interfere with the relationship between player and coach and believe the use of these apps can promote this relationship while also giving the player invaluable visual cues about improvement of their technique – surely the aim of coaching in the first place. In particular I do not want to lose the vital human component of coaching and see technology as a tool in the coaching toolbox, not as a replacement for sound coaching. I urge you to attempt to incorporate one of these apps into your coaching workflow and look forward to contact from you as to how you feel the process has gone. Certainly, it introduced a different emphasis in my personal coaching and a really positive reaction from the players involved, I regularly use ubersense in both rugby and athletics as well as my PE teaching. It would be great to build up a battery of NZ relevant videos to share from the Sport NZ community both from coaches exchanging opinions on players technique and an opportunity to view some perfect models of NZ’s best performers. This would also be a great resource for coach education, and address the problem in NZ of large travel times. Comment below if you have any interest in helping build up a battery of resource videos and I will set up and share a dropbox folder with videos in. As I continue to write articles on technology in sport I am interested in what the coaching community would like to discuss, I would welcome your input into this. As an extension to this article I will share via my twitter feed a number of other apps which I regularly use in my coaching process and look forward to discussing these further and in particular having new apps recommended through the comments section of this web site or via twitter. I can be found and contacted on twitter @tech4coaching and emailed at jimdickinnz@gmail.comand look forward to feedback and interaction with coaches from NZ and the rest of the world.